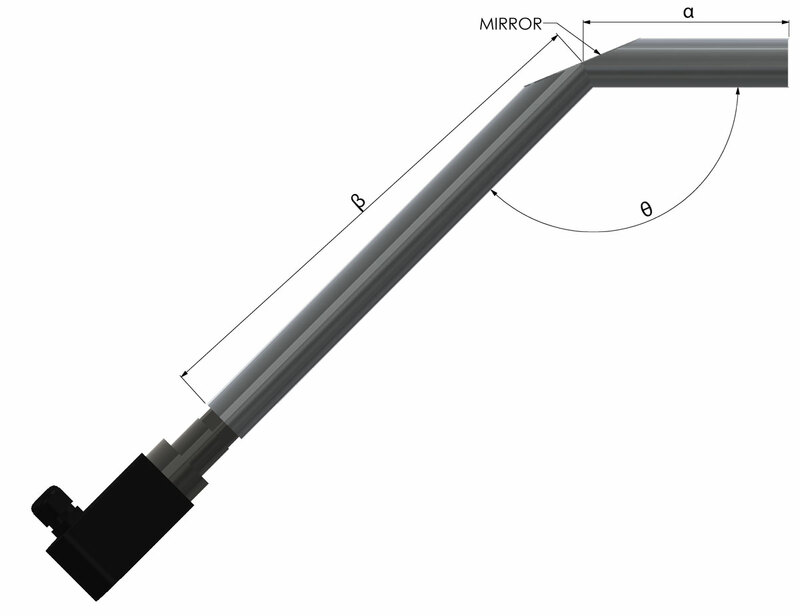 Periscope for UV Sensors for line-of-site positioning (UV sensor sold separately). The Zintronix Z-Scope is a periscope for UV sensors. The angled tube and mirror combination allows you to create convenient line-of-sight positioning, while the stainless steel construction of the tube, along with the ability to distance the UV sensor, helps to protect against excessive temperatures. Please note that UV sensors are sold separately (for example, UVS 10), and that a purge/cooling air connection, which may be needed in your application, is not included. Z-Scope is a custom item, tailored to your needs. When you click the “Buy Now” button, you’re setting the customization process in motion. Follow the prompts to provide contact, project, and payment details. One of our sales engineers will contact you to collect additional data prior to fabrication of your Z-Scope. Please note that, as the dimensions and weight of your Z-Scope cannot be known at this time, freight charges must be billed either collect or separately. ½″ NPT internal thread. Replaces UVS 8T. ½″ NPT internal thread and cooling air connection. Rp ½″ internal thread and M20 cable gland. Replaces UVS 6. Replacement UV Tube for UVS 1, 6, 10. Quartz glass disc with seals. Zintronix Z-Swivel UV Sensor Swivel Fitting, 1/2" NPT. Zintronix Z-Swivel UV Sensor Swivel Fitting, 3/4" NPT. Zintronix Z-Swivel UV Sensor Swivel Fitting, 1" NPT. Zintronix Z-Scope UV Sensor Periscope.